Big GS fellow has a 510-4 that I'm going to try and get. Let you know. Vigilance in Living Counteracts Stupidity in Dying. I’m assuming by 510-4 you’re meaning an AMT? Yup, the SIG AMT 510-4. Tried like the dickens to get it but was told that he's gotta' think on it. Offered fair price but, you know. He's got my # and I have his. Hope you get it--- post pics if you do!!! Awsome! I recently acquired one myself! 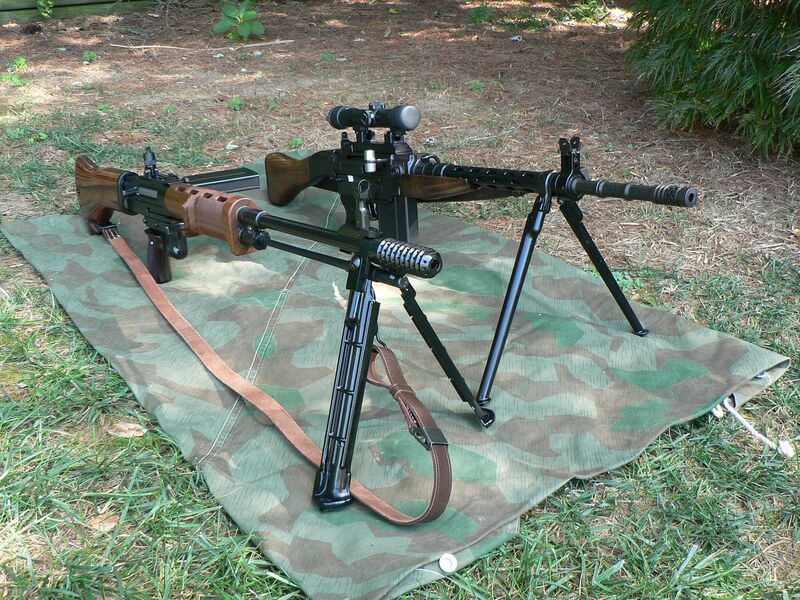 Beautiful rifles! is the rifle really that big ? ? ? 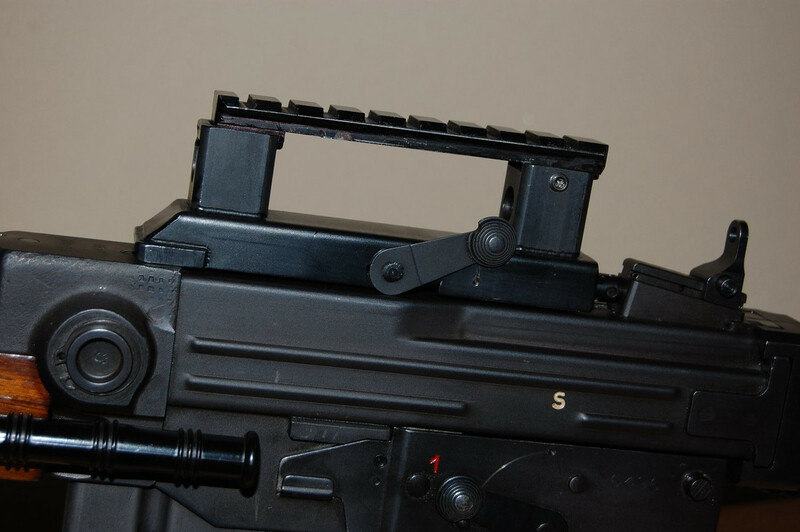 PRE-BAN Sig SG 550 or 551 something. Use tinypic and select discussion forum size for pictures. Works like a charm and been using them for years. Very simple, no cost and have close to 2,000 pictures in my file and they never seem to place a limit. so what are these 510-4 s selling for ? heard there was less than a couple hundred let in. Nah, there were probably between 2-3000 imported. If I were to sell mine, I would ask 7K. Forums are for furthering knowledge, not bragging about what you've got. Last edited by Combloc; August 06, 2018 at 18:14. Wow beautiful rifles! You dont see federal ordanance imports much. Mine is a benet arms import. I really love the AMT. I'm looking for a PE57. I got a stash to the side for when that time comes!! 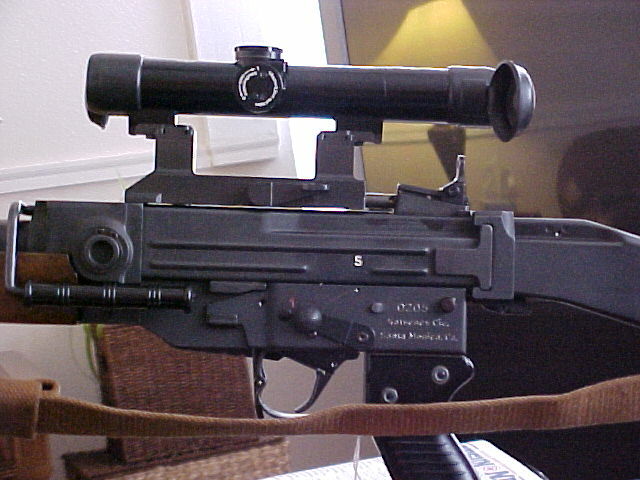 Also what FAL is that? Looks nice. I love the FAL. I have two 50.63s. Trying to trade one or sell one to get a G series. The FAL is nothing special. 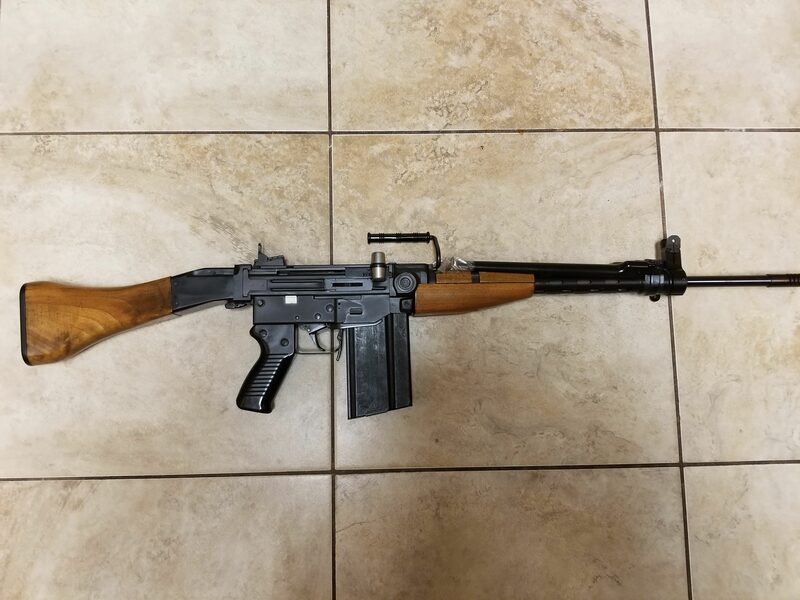 It's a matching Belgian made for the Austrians StG58 built on an early DSA Greyslake receiver numbered to match. Fortunately, it was built a number of years ago so it has the original barrel. You've got the real thing in a 50 series! Dang it! I for some reason can't get these pics to normal size. I will figure it out. I just bought a NIB 50.63 with owners manual, gun south warranty card and 12 izzy mags. Absoulty love it. I've thought about keeping both and keeping the non boxed one as a shooter but would rather get something I dont have. Ok back to the AMTs. I just got one recently. I have done as much research as I could but not too much out there. Is there imports that are worth more than others or anything else that raises or lowers value? I know he scope and mount are crazy price but anything else? 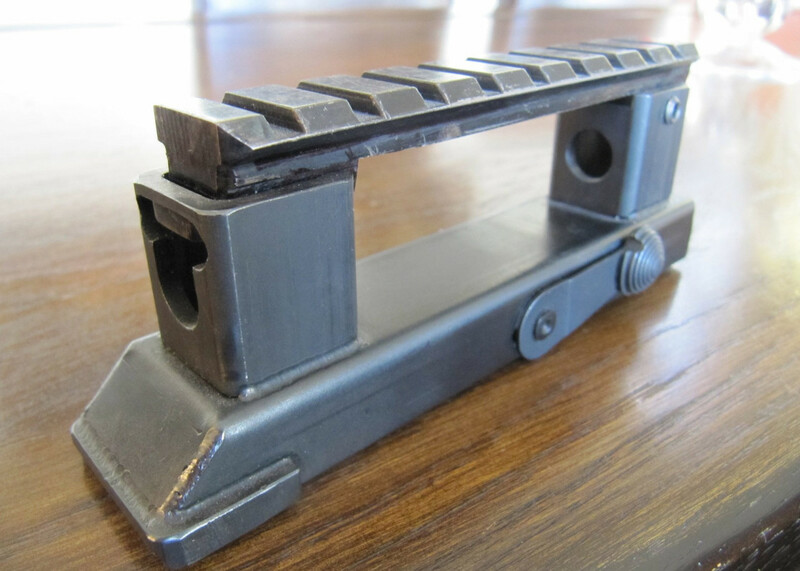 There isn't really anything about monetary value but there is a lot of detailed information including info about a damn well made modern mount. Be prepared to be bored though as the author is a little long winded. Wow! Outstanding information! After all the internet searching I never nlran across this fir some reason. Whoever did the artical is a stud!! 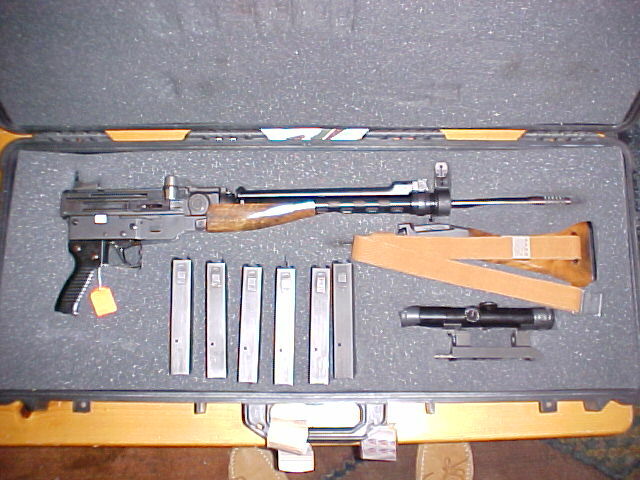 There were 7 importers for the SIG AMT--- as far as importers, the only one of greater value would be the Katsenes Cie (6 imported in 1969) that were built around full auto receivers (similar to the FN FAL "G" Series)!!! 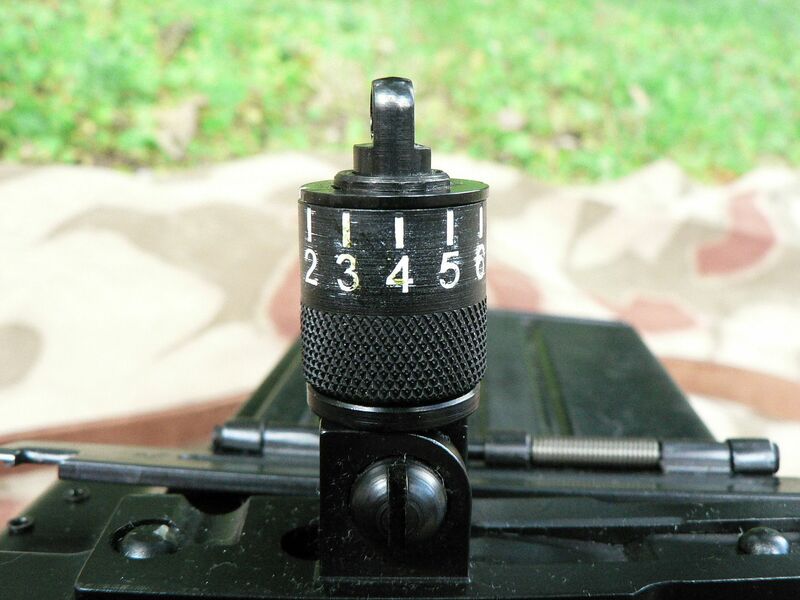 There are some with no importer markings and marked "SIG-AMT" or "SG510-4/AMT"--- the latter could be worth more because of the markings. 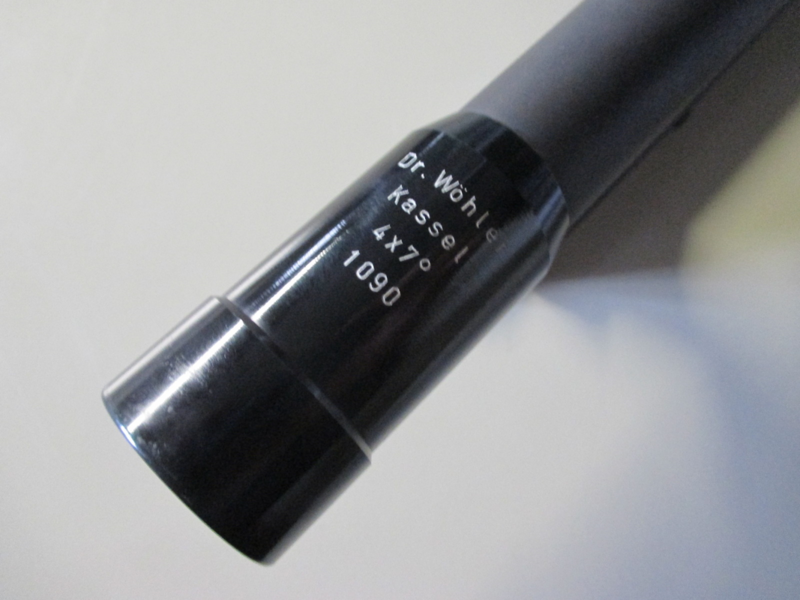 The Dr. Wohler 4x7 scope/mount will cost $7K-$9K, depending upon condition, and factory magazines are $200.00-$250.00. Nice SIG AMT and FN 50.63. From my understanding there was some Katsenes Cie marked AMTs that were rewelds any truth to this? Mine is a Benet Arms import. I believe that would be late 60s early 70s. I got lucky to find this for the price I did and as you can see it's in mint condition. With mags going for that much I shouldn't of passed on the 10 rounder for 25 bucks the other day. Yikes! 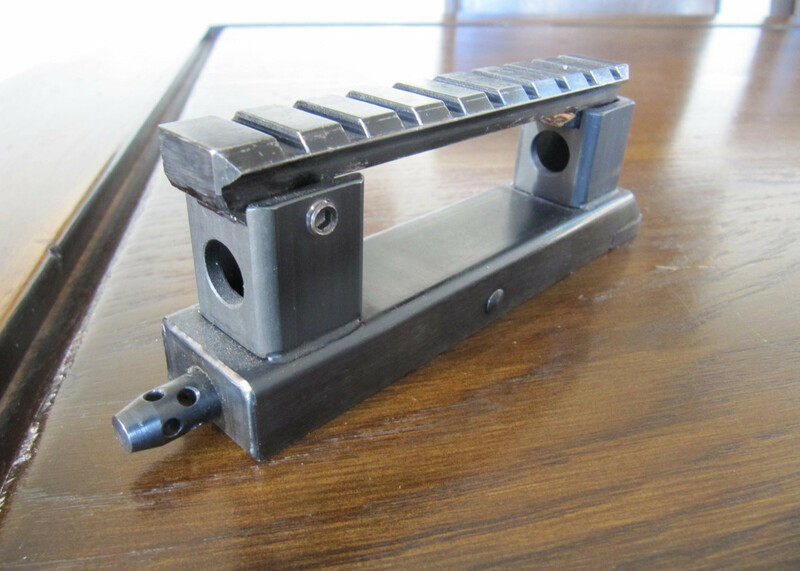 There was 1 verified sample of a Katsenes reweld on Gunbroker, and you are correct on the time frame for the Benet imports!!! Last edited by AGG; August 14, 2018 at 10:16. Great thread. I just got a 550-2. Now I want another. The G-Series will be easier to find than the PE57!!! I know of at least one other NIB P210 along with matching number .22 conversion kit . And like you, my other 210s are shooters with my P210-5 being the favorite. Good luck with your pin situation. 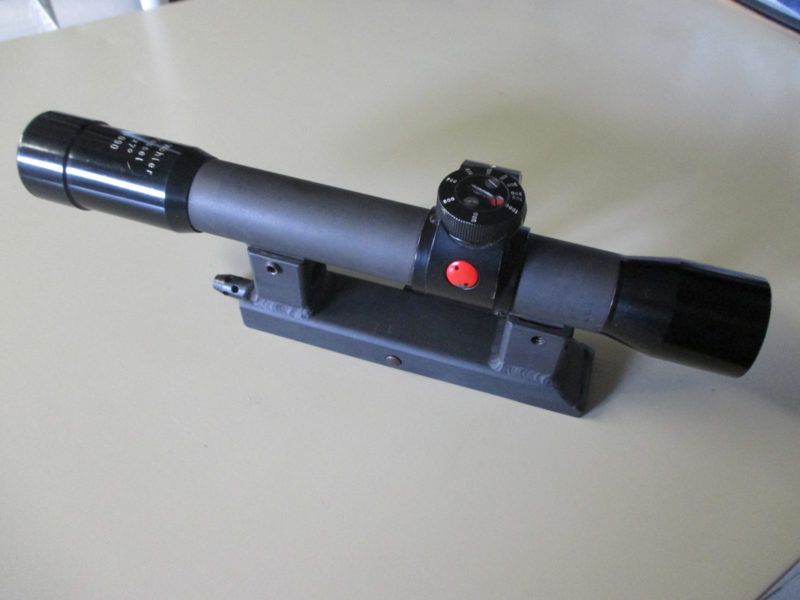 Believe there are differences between the SA (PE57) and FA (Stgw 57) receivers--- I cannot recall the specifics, but the front/rear trunnions are similar!!! 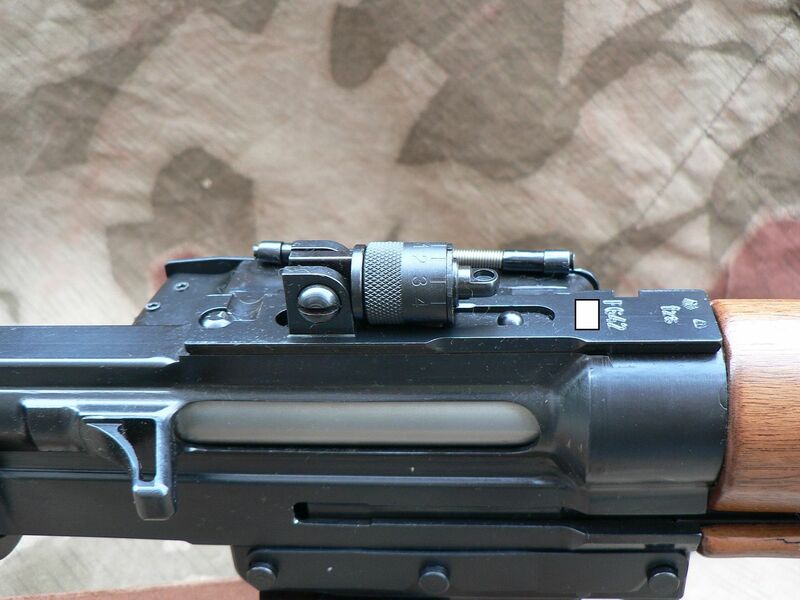 All PE57's have the scope mount attachment points on the tops of the receivers, while only Stgw 57's (A555501-A595500 out of 840000 units) have them. 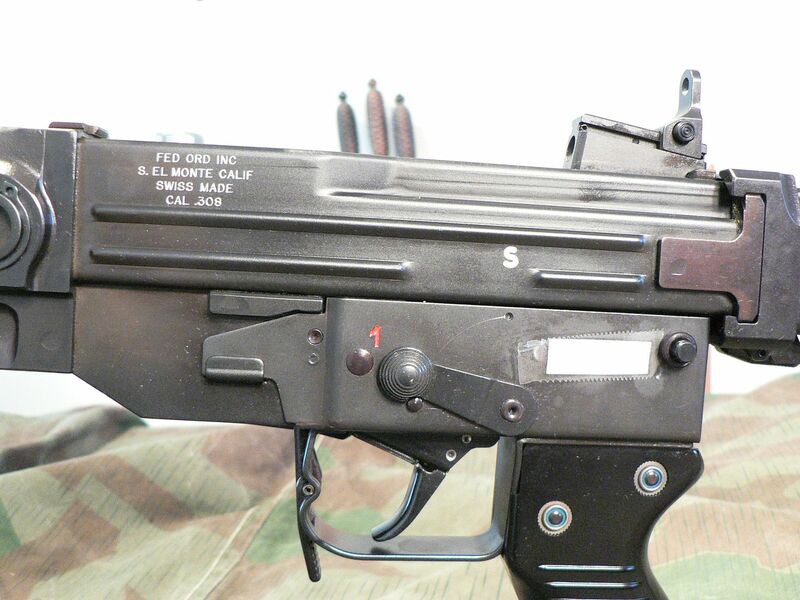 The only FA receivers imported (and grandfathered ~ FAL G-Series) were 6 SIG AMT's imported by Katsenes Corp. in 1969). On the tab, the other side of the white is black--- I think there is also an inward protrusion when the tab is showing white that affects the fire capability. 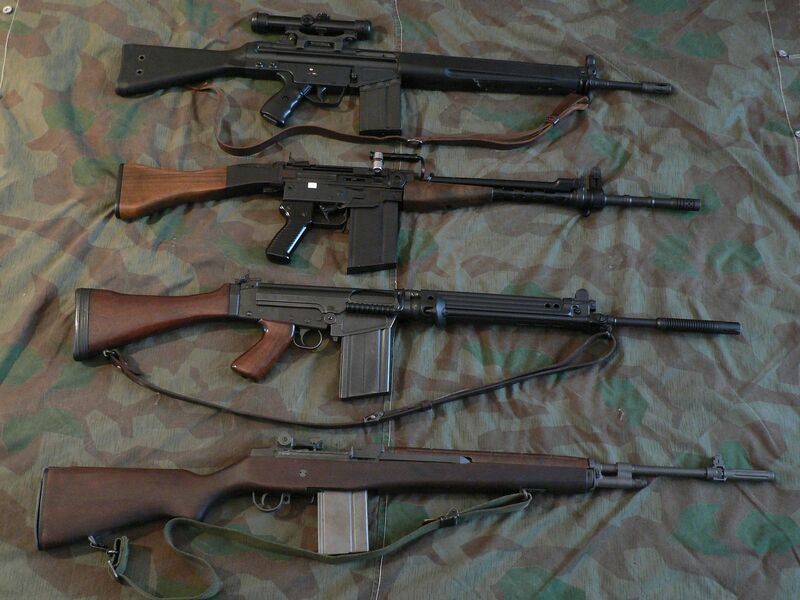 Combloc, nice group of rifles looks like you need to standardize on some sort of MBR so can share magazines and parts. At least that's what people try to tell me that don't understand the mind set of a collector. I figure five or six of each is standardizing. Just added M1a #6 but it's 6.5 Creedmore rather than 7.62 NATO. My next will be in 6.5 Creed as well. 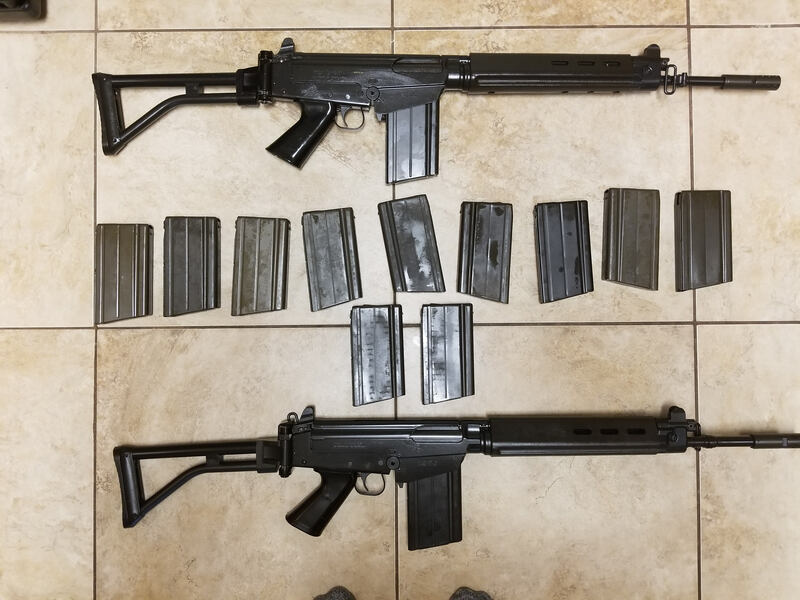 Have six FAL's but two are 5.56, two are inch and two are metric with two more inch kits and another metric kit on the burner. Have two G3's and three CETME's plus six AR 10's in three cartridges and next pair will be in a fourth cartridge. Have caught flack that should choose one then lay them in deep and wide. Like the variety and sure if world comes to an end will keep a few rifles running. Went from AR 15's in seven cartridges to three and couldn't stand it so now have them in five cartridges but much better cartridges for needs. My 20 Tacticals and 204 Rugers are gone and have TAC Six and 458 SOCOM in thier spot. Now up to over two dozen 5.56 and building units #15 and #16 in 6.8 spc II. Isn't variety and having different tools for different jobs nice? 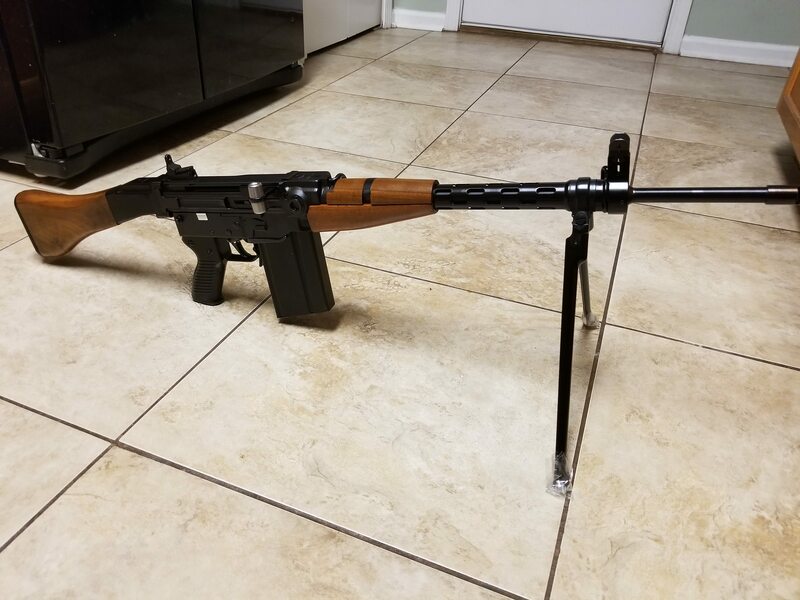 Have to say oddest items in the stable are the FAL's in 5.56. 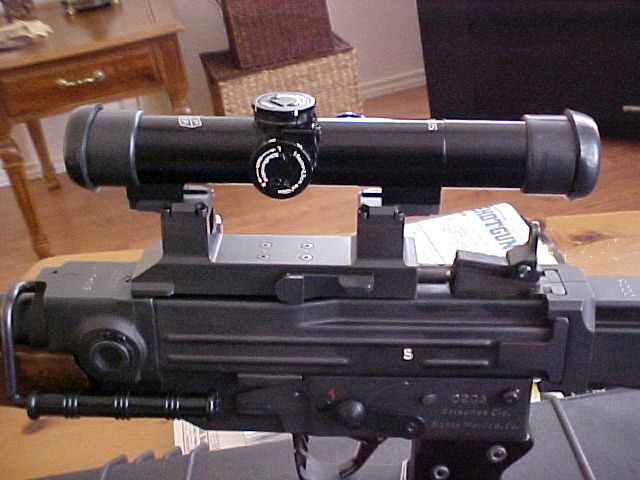 A poodle shooter cartridge in a MBR chassis rifle. Of course recoil isn't a problem with them. Like seeing someone else that has a few of everything, warms my heart. Here is my Katsenes import SIG AMT. It was imported in '69. I got it in 2000 from a Western PA/OH FFL who was giving up his license. He had two (2) Katsenes AMTs. I know Tony has seen pictures of it before. 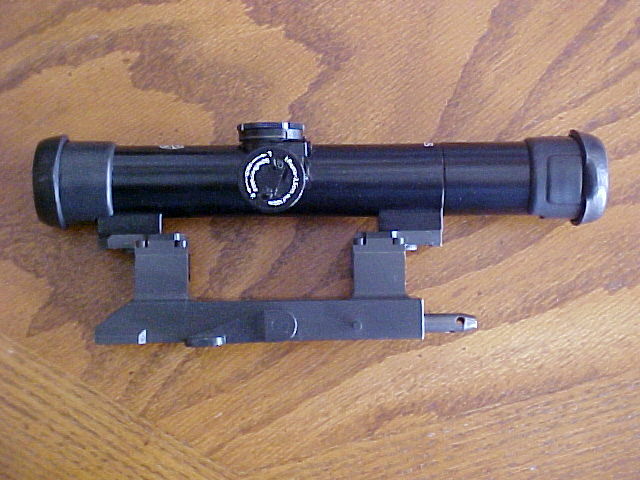 The Estes Adams scope mount looks and performs perfectly. 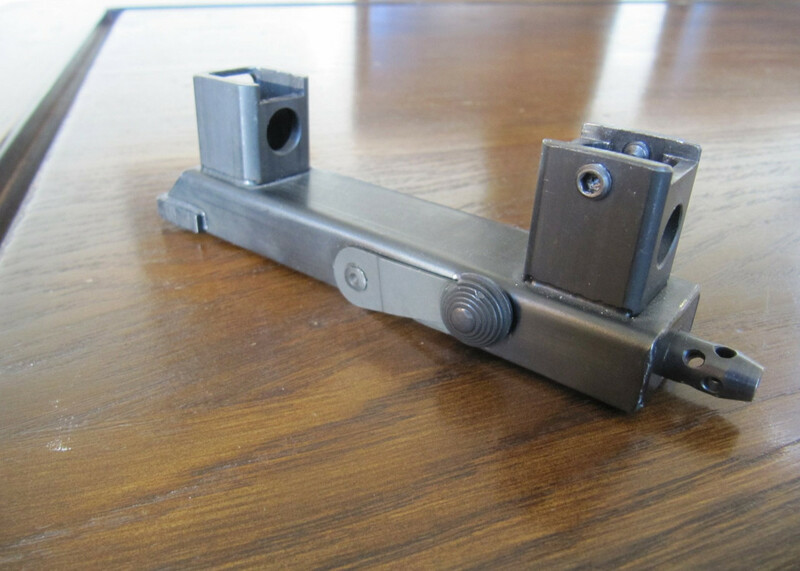 For reference, here are some pics of a factory SIG AMT/510-4 scope mount with and without a Dr. Wholer 4X scope. No, this isn't mine. I found the pics on the inter-web. Last edited by mg34dan; September 22, 2018 at 10:48. It hasn't been mentioned, but the AMT is the softest shooting .308 Winchester/7.62 NATO shoulder fired weapon one can experience. The HK 91/G3 is a uncouth beast by comparison. 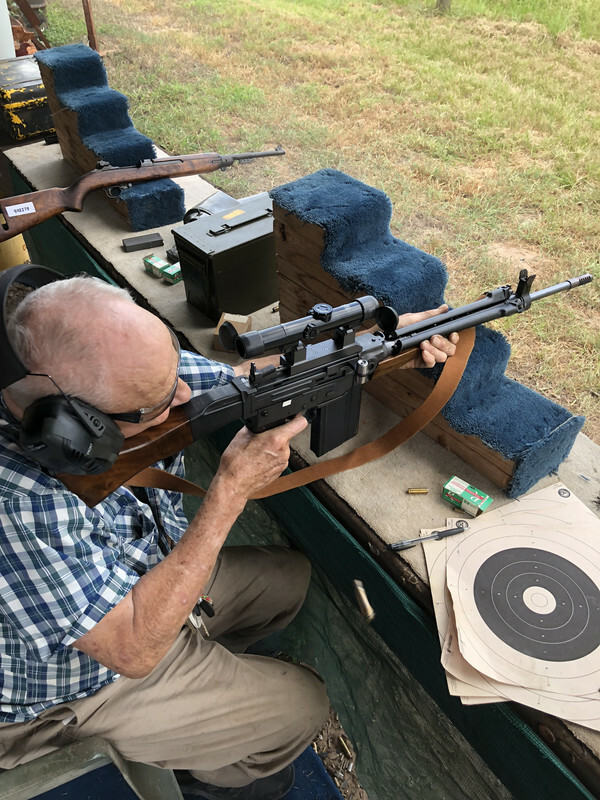 Here is a picture of Dolf Goldsmith firing my AMT a few weeks ago. 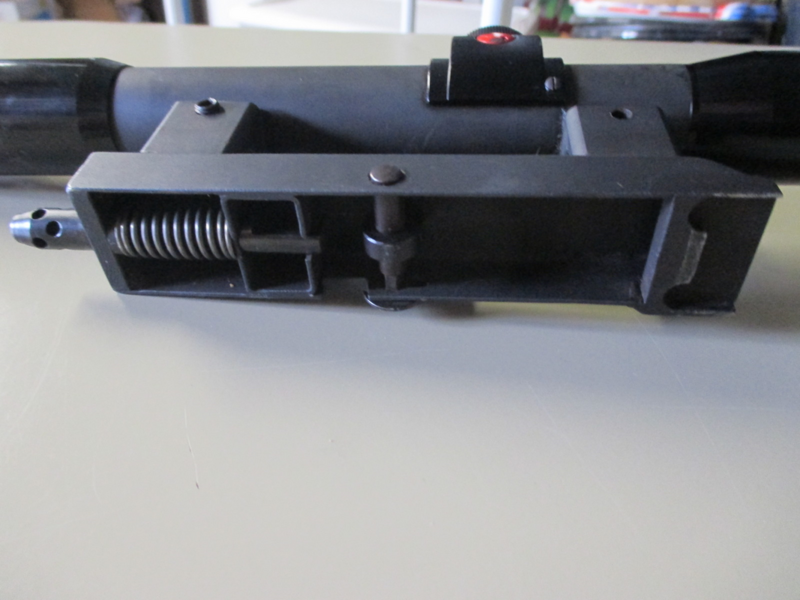 You can clearly see the spent .308 shell casing in the air beneath the magazine. Our little shoot took place one week prior to Dolf's 90 birthday. 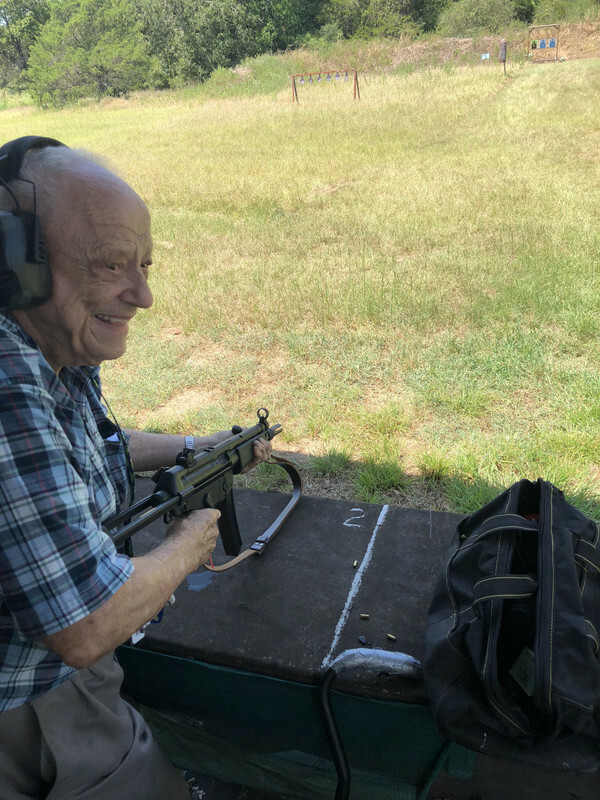 As an aside, Dolf also enjoys shooting an MP5.